The Wild Inside: Time passes, things change ..
Fun and Funky to Upscale and Traditional Jewelry! Time passes, things change ..
A lot can happen in two months. While sales are usually slow (if not totally non-existent) this time of year, it's generally a time of renewed creativity and production. I lost this time last year to my thyroid - pretty much the entire winter and early spring was a wash due to lethargy, anxiety, apathy and a total lack of motivation .. all because of a little butterfly shaped endrocrine gland in my neck. Who knew one little organ could cause so much trouble? This winter the flow of creativity and production stopped due to my dad's on-going ill health and resulting death on January 18. It seemed like things were going along swimmingly, but the body and brain are strange and wonderful things .. they often react in totally unexpected ways. Most of the stress I experienced was worrying about the effect my dad's death would have on my mom and a brother who lived with them. While it takes time to assimilate these kinds of life changes, the waters seem to be calming a bit. After a fabulous visit by my mom this past weekend - something she had never been able to do in the past due to her care taking duties - I'm feeling a whole lot better, and she got a much needed break away from her usual routine and environment. Some interesting things are happening in my brother's life as well .. so perhaps despite the fact that a part of our lives which was so familiar is gone, we've all found a little peace to help get us to the next chapter in our lives. I'm still moving a little slowly .. but the days are getting a bit longer, we've had a couple brief thaws to remind us this dark and snowy period doesn't last forever, and some promising artisan things have been happening to propel me into a more creative state of mind. If you're interested in shorter, but more frequent posts, check out my relatively new Facebook profile (Karan Marie Cross). I find it easier some days to make a quick note there, and I'm sure you'll find it likely that show dates and links to show events will find their way to Facebook in a more timely manner .. at least during this period when I'm still trying to gear up and get back into the swing of a routine. I am sorry about the loss of your father. I pray that you are blessed with more hope as life unfolds new blessings for you and your family. Thanks, Deb .. we weren't really close, and his dementia was making it difficult to even connect any more near the end. Though I have one incident that happened while he was at Samaritan Medical Center in Watertown that I particularly hang on to as a sort of happy moment of dad clarity. I'm only just getting back into the studio again after almost three months .. I feel like a stranger in my own environment. Hope that changes soon! year or so. Times are tight, folks .. 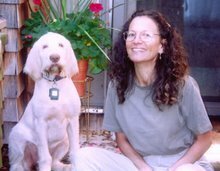 I, my husband and our Spinone Italiano (Cara) can be found on the Oswegatchie River in Northern New York. I moved my jewelry business from Albany, NY to follow my husband's new career as Executive Director of the Frederic Remington Art Museum here in Ogdensburg. I make hand crafted artisan jewelry using precious metals, pearls, precious and semi-precious stones, handcrafted lampwork glass, Swarovksi crystals, ancient trade beads, and a continually growing list of materials too long to itemize here. I enjoy all manner of jewelry creation and, as a result, find it difficult to focus on any one style or skill set .. I knot pearls; string beads; bend and wrap wire; cut, saw and drill metal sheet and continue to experiment with Precious Metal Clay. I never tire of learning new skills, and hope you enjoy the images and ramblings I post here. Please feel free to contact me if you're in the area (or even if you're not in the area). I would love to show you more! Patrick O'Brian - the Aubrey/Maturin series is timeless!